So Last Saturday me and the Mr ventured out to do something very very exciting! We went shopping for our wedding rings! I'm glad to say it was such a success. We decided that it was high time we celebrated such a successful Fete, and the only way to do this? With food of course! I've heard so much about Bill's through the blogging community, and when I saw one local to me I thought why not check it out for myself. Let's say we were not disappointed! When we first entered we were amazed at the setting, steel tubes, rustic tables, candles and little metal pots. I loved it instantly. The walls were lined with little jam jars of sweets and sauces. There were little chalk board signs hanging up around the place with information of the food on. What I loved even more were the little dinky salt and pepper pots, I have told the Mr that we need some of these for our own house. We were taken to our table and given the menu's to muse over, there was so much choice it was hard to pick! We decided to order drinks first which I have to admit was just as taxing, there were so many choices of smoothies, champagne and quirky lemonades. We both decided upon the Pink Lemonade Ice Cream Float. Yes you heard right, it may as well have been a desert rather than a drink but I can confirm it was an excellent choice. It arrived bubbles galore. After fighting through the vanilla froth you are hit with a lively sweet pink lemonade, followed by a kick of the thick ice cream. Like heaven in a glass, it was divine. You even got a fresh strawberry on the side. For mains the Mr went for the obvious, a burger, A succulent Hamburger with Monterrey Jack cheese. In his own words it was delicious! We loved how it came served on a wooden board, with a separate little pot for the sides. I opted for something that may sound very ordinary, a Cod Fish Finger Sandwich, but it was so good, and much more luxurious than what you would knock up at home! The bread was lightly toasted to give it just the right amount of crunch without being dry. The fish tasted fresh and very moist, with a good helping of tomato sauce. Yum. It's safe to say that we were both very satisfied customers and the service was excellent and quick which is always fabulous. We sat and chatted for a while before heading off to the rest of our day. Bill's also do breakfast served until 1pm on Saturdays which I definitely want to try- bring me the pancakes! Choosing your wedding venue is just as hard as choosing your dress. You want something that suits your theme, you as a couple but also be practical and affordable. Sounds simple enough, but believe me, it's not. We Uhm'd and Ahh'd the whole two years we've been engaged over where exactly we want our wedding to be, before we stumbled on this beautiful local venue. Now I'm no wedding expert, but I thought I would share some tips on how to choose your perfect venue from my own personal experience. 1. Set yourself a budget. In this budget consider food, drink, décor and flowers. The bigger the space the more décor needed. 2. Prepare a rough guest list, this will help you determine the size of the venue. Too big and the room will look empty, Too small and your guests not be able to move! 3. Think about your theme, are you looking at a shabby chic summer affair? a lovely rustic barn would suit that well. Or are you after a black tie ball, think boutique hotels for this. There is a venue to suit all themes. 4. Think about the season your getting married, if your having a high summer wedding then outside space is important for your guests to be able to cool down. Maybe your after a winter wonderland wedding, then inside space is important as your guests are unlikely to want to be stuck out in the cold! 5. Write a list of entertainment you want and ensure you ask the venue if they can host this. Some venues have noise restrictions and therefore live bands are a no, no. Others may not be able to have fireworks, is this something you wanted to have on your day? Make sure the venue suits the type of day you want to have and can accommodate your entertainment plans. 6. Finally, choose a venue that suits you. After all it is your special day. Ignore everyone else's view's on your venue, as there is a high chance you will have a multitude of opinions thrown at you, and go for what you want. Hope you found this post helpful, it's something we have definitely followed when looking for our own venue. Some of you may have read that me and the Mr are planning on buying our first home soon, therefore I have been going a little crazy in the home sections of every shop. I have in mind a modern take on shabby chic for the décor. Lots of white, silver, grey's etc. So you can see that theme emerging from some of the things that we have been purchasing. Another thing you may notice is a lot of glass wear, we have been buying lots of glass pieces as they create the illusion of not taking up much space. As well as creating lots of clean lines to a space. We decided to splash out on some fancy glasses for those cheeky coffees on a Sunday morning, John Lewis have some excellent quality products and we were spoilt for choice! This Primark Throw is lovely and soft and it is going to have pride place on our bed, the silver and grey theme will run throughout most of the house, with the odd pop of colour here and there. I adore this clock, this was very much a me purchase and not the Mr! But I just love the idea of having this either on a mantle piece or window sill. I love the white wood effect and it's something I'm definitely incorporating into the home. Another little buy was this cute slogan mug, these were part of Home Bargain's Valentine's collection and really was a bargain at £1.99! I am a sucker for cute mugs and have quite the collection building! We bought some more 'Fancy' glasses from John Lewis in the form of these frosted glasses. These will definitely be part of our 'special occasion' dinnerware. This is what the glasses look like out of the box. The frosted glasses are definitely my favourite of the two, they are just so unusual and unique looking. Well that's it what we have bought recently, expect plenty more of these as we get closer to moving! Hope you enjoyed having a sneaky peak at what's on offer in the home ware department and let me know if you have any 'must have' home ware bits. I can't believe January is over already! It seems to have flown by in a whirlwind with so much going on the days felt like they were just an hour long. I don't think I've stopped all month! I've decided to make this a permanent fixture, a review of each month. So that in years to come I can pop back and see what I was doing January 3 years ago, I just thought it would be a nice way to remember the big and little things I have done. So here we go, the first instalment- January. I kicked off the year fantastically, I graduated from University, one of my proudest moments so far and the best way to kick off 2015. We celebrated with plenty of food and drink and watched the DVD over and over again. It's fair to say I made the most of it. 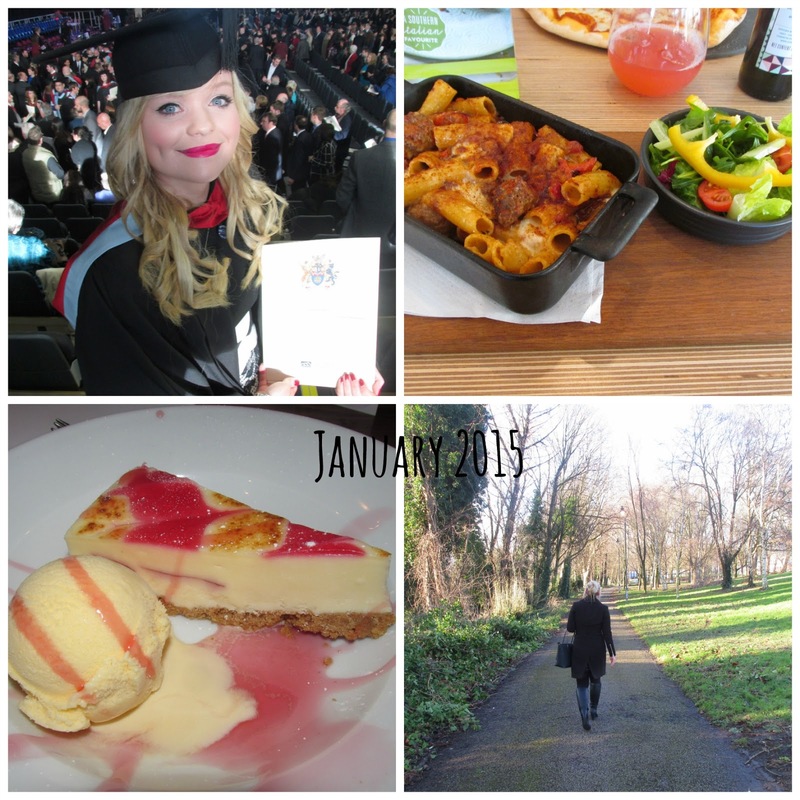 I managed to get a fair few blog posts up this January too, trying to keep my new years resolutions in check. Talking about resolutions I am getting closer to one of them- buying our first house! We have been working and saving hard and actually have been approved for a mortgage! So let the house hunting commence- I'm unbelievably excited and can't stop looking at interior décor and furniture. I'm excited about silly little things like being able to lounge in the bath without anyone needing the toilet or baking new recipes in our new kitchen. I'm sure these feelings will pass after a few months but for now I'm glad to be excited and making progress in the right direction! Another resolution that I've been happy to stick to is spending more time with my family. Me and My Dad love going on walks and have managed to make time in our busy schedules to walk the dog together. I love this resolution and really enjoy sticking to it. My family is important to me and what with me potentially moving out this year I want to cram in as much time with them as I can. I've also kept up with my driving lessons, which I wish I had done when I was 17. If I could turn back the clock and kick my 17 year old self who thought that it was more important to use her money to buy clothes rather than drive then I would give myself a good whack. I hate not having the freedom to travel as I wish and having a car would be so much easier. I'm determined by the end of this year to have passed. I will keep you posted. So there we have it- my very hectic yet special January. Here's to February, let it be just as crazy and whirl wind.